You can’t say you’re all in until you’re ALL IN. This completes the wager. Every last chip has now been shoved into the middle of the table because I like the hand I’ve got. Strong talk for a non-gambler, huh? Well, it paints the picture that I want you to see. Commitment. Total professional commitment. For starters you can expect a change. That’s not quite true – you can expect many changes. Here are the ones I’ve got planned so far, but I reserve my right to add more if I think they’ll bring you value. The subject is going to focused on the advantage provided by the people in our lives, both professionally and personally. The focus is still on growing our small businesses and our leadership. But it must include our growth as human beings, too. The stories, strategies and tactics will concentrate on our effective interactions with the people who are making a difference for us. There will be plenty of “how to” learning coupled with real life examples of people who are finding their lives enhanced by the people they allow into their lives – and the people who allow them to enter theirs. As I get some details ironed out you should expect new episodes to be released every Sunday afternoon. My goal and commitment is to make the episodes hit your feed weekly. I think it’s important for you to be able to count on me and I must apologize to you for my past failings. I’m already working on a schedule that will provide you a new episode each week by 6pm Central each Sunday. Additionally, The Peer Advantage Email Newsletter is going to be released monthly. It’s another communication tool that I’ve neglected for too long. The newsletter will likely include links to special videos, podcast episodes and written content that won’t be available elsewhere. So make sure you sign up today. Look for The Peer Advantage Email Newsletter to arrive every 7th day of each month. Seven? Yes, seven. Biblically the number 7 means completeness and it happens to be the number of small business owners who will form each group of Bula Network. The format will vary depending on the subject of the episode. I may even break with my long-standing tradition of not doing interviews. It’s not that I don’t enjoy them, I just didn’t want to rely on a publishing schedule that hinged on somebody else. But there are some people I really would like to bring to you…so you should expect to hear an occasional interview. And not just with so called “thought leaders,” but with all sorts of people who can contribute to our collective improved understanding of The Peer Advantage. The length of the episodes will vary, but my goal is to keep them under 40 minutes. I’ll follow that age old radio mantra, which translates into most every form of content delivery including public speaking – it’ll be as long as it needs to be and not a second longer. The big objective is to avoid being boring. Sound bites. We’re in a world that is fond of them and I’m no different. Snippets of what people say can really liven things up. I plan to insert episodes with various sound bites that illustrate the subject at hand. What Else Would You Find Valuable? 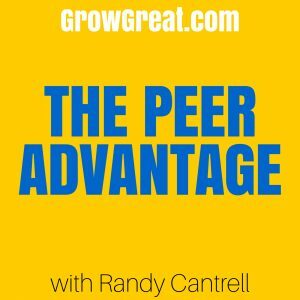 How Can I Make The Peer Advantage High Value For You? Nothing is off limits. Fire away. If it impacts small business owners then I’m interested. If it’s something small business owners can leverage for their own learning, I’m in. Now, all I need is a bit more time to get all my ducks lined up so the new work flow kicks in to let me achieve these objectives. I’ll keep you in the loop every step of the way. You’re part of my journey and I hope to be a small part of yours. I appreciate you. Thank you! P.S. Surprise! I’m going to open comments! This decision was made AFTER I recorded the show today. I vigorously debated this with people – some who are strongly on one side or the other – and decided over the past 24 hours to just do it. So it’s there if you choose to use it.